When it comes to bathroom style, those who enjoy clean lines and a sleek, clutter-free look often prefer modern bathroom vanities, faucets, toilets, bathtubs and accessories. Many modern bathroom designs feature geometric shapes and materials including glass, chrome and solid-surface vanity tops. While white is a common color found in many modern bathrooms, some people choose to add splashes of bright colors as well. 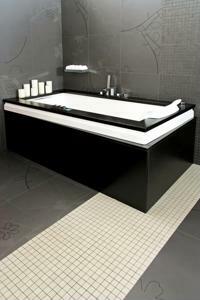 However, those looking for a unique focal point for a modern bathroom may consider a black bathtub, like the Number One Bathtub by Corcel. According to Trendir.com, this bathtub, which is constructed of carbon fiber, features an aerodynamic shape with racy lines and curves. "[It is] perfect for a luxury modern bathroom," the website states. "The way its surface plays with light gives it a mysterious, black magic kind of allure. This piece is truly for those looking for something special and unique - something dramatic but in a straightforward, unfussy way." Whether you decide on a black tub like this one, or decide to infuse black into the space with tile, paint or accessories, the dark color can help create an uncommon modern bathroom retreat.